O Gauge production was critical to Marklin’s expansion and, as such, the O Gauge product line in conjunction with 00 Scale trains ushered Marklin into a toy-production “Golden Age.” This series, “A History of Marklin O Gauge,” will take a look at the beginning (1893), middle (Golden Age), and end (1954) of the O Gauge product line. 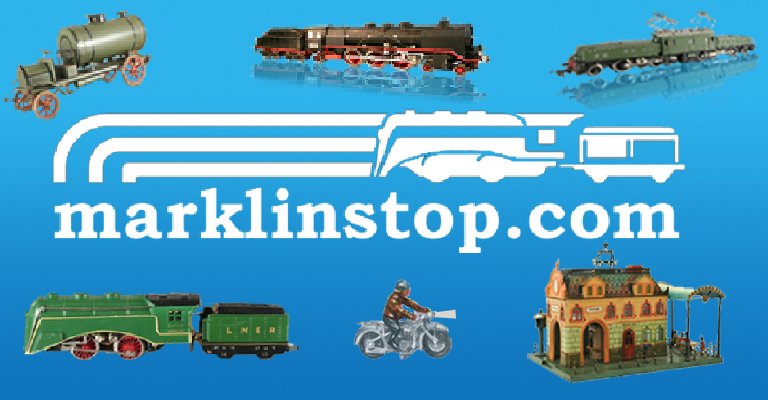 The first O-Gauge Marklin locomotive (clockwork) was produced in 1893. 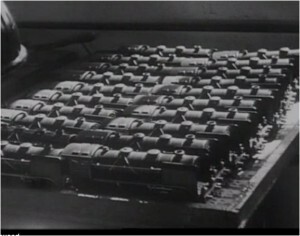 These O-Gauge sets were first displayed at the Leipzig Easter Fair. 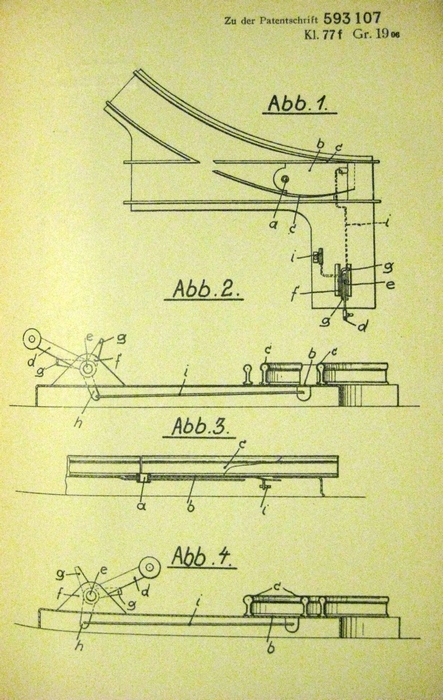 The above patent from the 6th of October 1909 detail the ingenious coupling design Marklin devised in the early 1900s. This design was crucial to the easy and reliable coupling and uncoupling of locomotives and cars. The design featured a “tongue and slot” mechanism with a small cross-pin which securely attaches the couplers together. This design replaced the earlier “loop” couplers and maintained in existence until the end of O Gauge production. 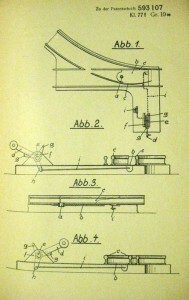 The patent shown above was an early electronic switch design which allowed for remote track switching by way of a push of a button. An incredible lever mechanism utilizing leverage over a fulcrum point allows a small electromagnet to switch the heavy metal tracks. 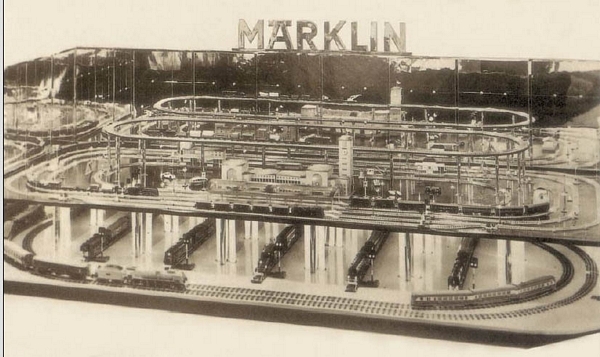 As always, I like to focus a little on the humble beginnings of the American market for Marklin. 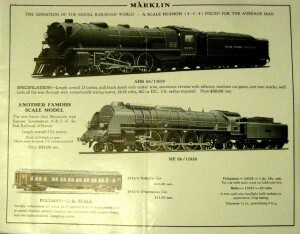 Early in O Gauge production (1900-1920s), Marklin affixed cowcatchers and bells to German outline locomotives and called them “American.” With rise to the “Golden Age” in the 1930s, Marklin realized the potential of the American market and – perhaps competing with its rival, Lionel – produced a series of what I like to call “uniquely” American locomotives that were not just cannibalized versions of German outline locomotives, but rather American version locomotives in their own right. Such locomotives include the “Commodore Vanderbilt” AK 70/12920 of the “NEW YORK CENTRAL LINES” railway. Other locomotives include the mighty Hudson AHR 66/12920, ME 66/12920 ETAT, and various rolling stock and larger passenger cars including the unmistakable PULLMAN 2924 and 2925 cars. Important dealers for the American market in the 1930s include Richard Marklin, Bruce Hastie, and many others. The important, but vastly unknown dealer of NY. 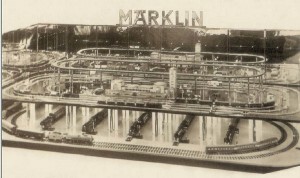 The impressive 1937 toy fair display for Marklin featured both 00 Scale and O Gauge. The display featured a complex elevated 00 Scale track section. From the photo below, a double-header RS 700 train can be seen pulling a stock of 340-series cars. An SLR 700 locomotive approaches the grand 2039 G/00 Stuttgarter Station and two 424 B platforms. Two 406 Fahne (Flags) flank either side of the station and are typical of the time period. Several “Miniatur-Autos” are also scattered around the station to create a realistic scene. It is clear, however, that since the introduction of 00 Scale in 1935, O Gauge has been put on the back-burner (or the lower shelf in this case!). 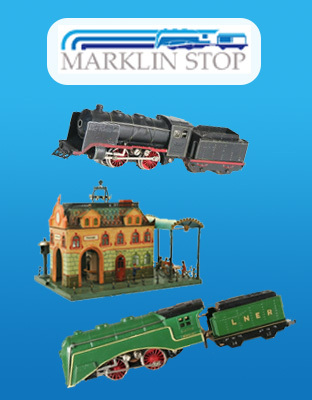 Despite its rather low positioning on the layout, a careful observer will notice that many different countries are represented in the product line: (from Left to Right) a German outline HR 66 12920, an American outline AK 70/12920, a SWISS crocodile CCS 66/12920, an English L 70/12920, and a French ME 70/12920 (as far as I can discern). Running around the ovals are a “Flying-Hamburger” treibwagen and a gray livery ETAT ME 70/12920 pulling a string of 40cm 1940 series cars. Do you have any infromation please on the letter classification system that Märklin used on its Gauge 0 (and also gauge 1). On the ties, there would be the trademark, and a letter such A or D and a number, usually 8 or 16, which I take to be the number of curves required to make up the circle. It is on the letters that I am wondering whether you might have information that you might be willing to share with me, please? Can a Marklin 0 gauge DC loc be run on an AC transformer? If I use a DC transformer what voltage is recommended to run the DC loc?